Onesimus was a Phrygian by birth and a slave to Philemon, a person of influence who had been converted to the faith by Saint Paul. 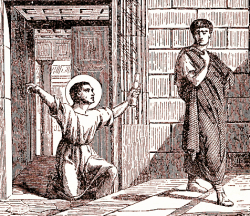 Having offended his master and been obliged to flee, he sought out Saint Paul, then a prisoner for the faith at Rome. The Apostle baptized him and sent him back to his master, with the beautiful letter we know as the Epistle to Philemon, asking for the liberty of Onesimus, that he might become one of his own assistants. Later, as Saint Jerome and other Fathers testify, he became an ardent preacher of the Gospel and a bishop. It is he who succeeded Saint Timothy as bishop of Ephesus. He was cruelly tortured in Rome, for eighteen days, by a governor of that city, infuriated by his preaching on the merit of celibacy. His legs and thighs were broken with bludgeons, and he was then stoned to death. His martyrdom occurred under Domitian in the year 95. Take heed not to do your good before men, in order to be seen by them.